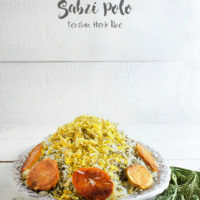 Sabzi Polo (Persian Herbed Rice ) is a truly symbolic dish to celebrate the first day of spring, the first day of the Persian New Year (Nowruz). I was at the gym the other day, pounding on the elliptical when I noticed a new segment on the t.v. above me. They were talking about S.A.D., Seasonal Affective Disorder. It has to do with mild depression that arises during the winter months, you know the winter blues, and it usually dissipates when Spring arrives. I could totally relate to this. The shorter days and longer nights have ALWAYS affected me. I love our long summer days, I stay up later, have more energy, and I’m generally a happy person. Now I don’t live up North where you really have short days, or even where you can live in darkness most of the day. But, those little changes in the Fall, when it gets dark around 4 o’clock and your wondering, “Is it bedtime yet?” I’m so glad Spring is only 12 days away! The first day of Spring has even more significance in my family, as it represents the first day of the Iranian New Year (read more about Nowruz here). 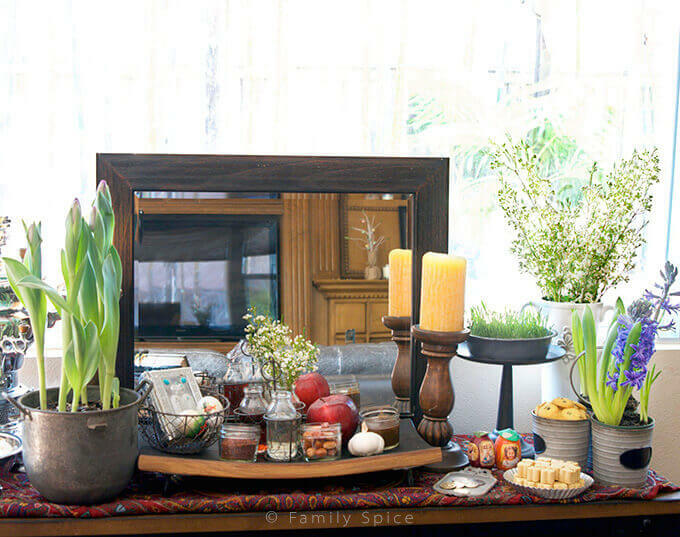 We have many traditions while celebrating nowruz, including spring cleaning and the sofreh haft seen pictured above. We are supposed to ring in the new year in new clothes. Darn, honey, I really do have to go shopping for new clothes! I have already bought my daughter’s new outfit for that day, that’s the easy part. I will have to find some new shirts for the boys this week. We don’t break out the champagne like we do in the U.S. or stay up for the countdown to midnight to celebrate nowruz. This year, the new year changes over Saturday March 20th at 10:32 am (PST), according to this source. Since it will occur in the morning, we will probably “ring in the new year” with my in-laws, take a break in the afternoon and then return to gather and have our traditional meal. And since my mother-in-law loves to cook for her family, I know we are in for a feast. 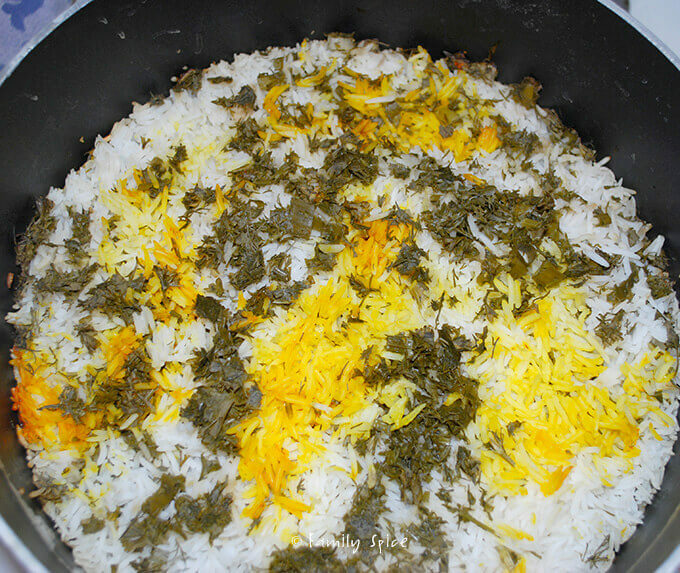 The one meal that you MUST eat to celebrate Nowruz is this Persian Herbed Rice (Sabzi Polo). The fresh herbs used in this dish represent rebirth, as everything that died in the winter is alive again for the spring. Herbs and fresh greens appear all over the nowruz menu. Fish is usually served with sabzi polo. Like in many cultures, the fish is a symbol for good luck in the coming year. 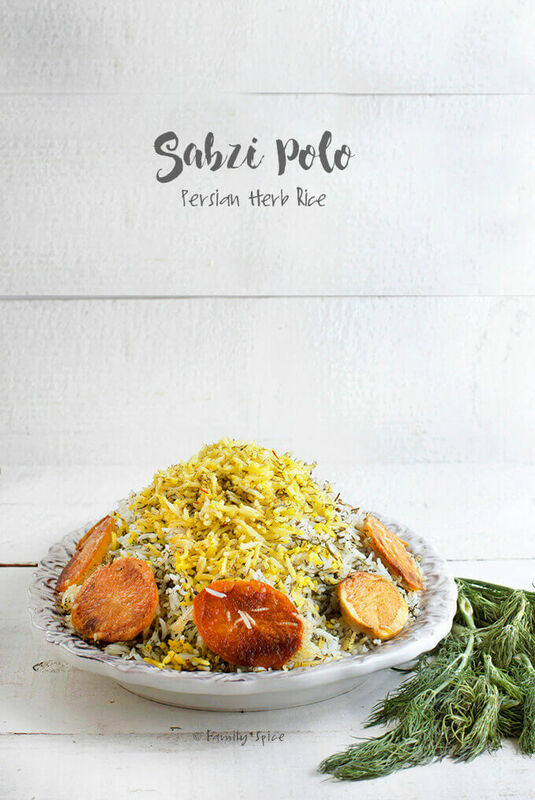 Now Sabzi Polo can be made in a number of different ways depending on the cook’s personal preference. Because sabzi polo is made of an assortment of herbs, the specific herbs you choose can vary. 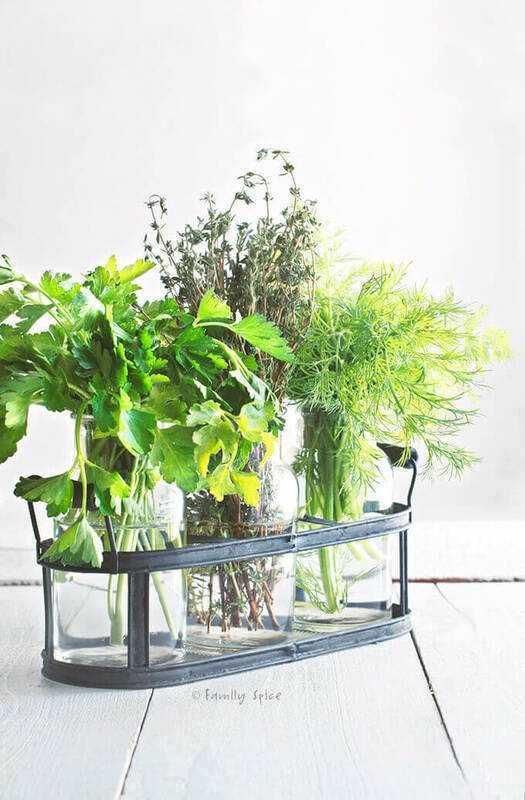 Some people use dried herbs, but I prefer fresh. My herb combination of choice for sabzi polo is dill, parsley, cilantro and green onions. 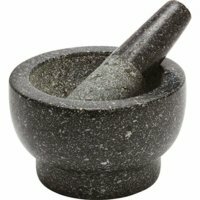 The quantity of the herbs used is also based on preference. I have had sabzi polo where you don’t see one grain of white rice. My kids won’t eat that. They like it to see some white rice, so I’ve toned down the herbs a little to our family’s taste. So, you decided for yourself which you prefer. 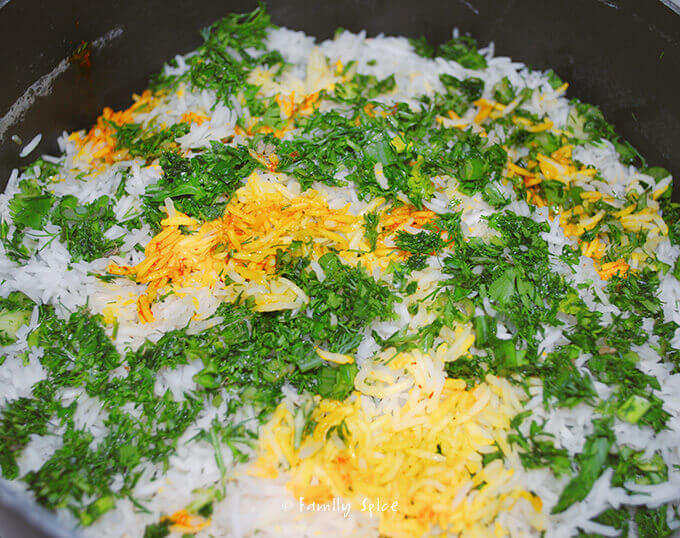 As with regular basmati rice, making sabzi pollo requires partially cooking the rice before steaming it. This requires about 6 minutes of boiling your rice, or long enough that the center of each rice grain is still hard. When ready, pour the rice and water through a colander to strain. Now comes the steaming process. I like to line my pot with potato slices, as my family loves potato tahdig. Then I layer in spatulas of rice and the chopped fresh herbs in alternating layers. I top of the rice pyramid with a drizzle of saffron infused water. Cover the lid of your pot with a dish towel to catch the steam and keep it from getting absorbed back into the rice. This keeps the rice from getting mushy. As I mentioned earlier, for nowruz fish is traditionally served with sabzi polo. Of course, you can also serve it with roast chicken or stewed lamb shanks. For nowruz, my mother-in-law typically uses the whole fish and fries it. This is not always received well by my kids and I personally prefer to bake my fish. You can use whole fish or filet. 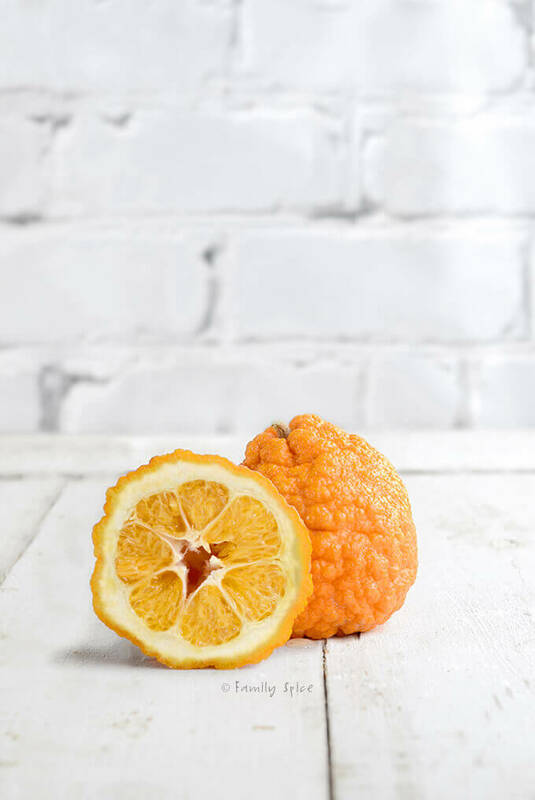 Spring means that sour oranges (narenj) are in season. These are also known as ornamental oranges. They look like bumpy oranges with thick skin are not sweet, but a type of sour. The flavor is a cross between an orange and lemon. Narenj’s make a great alternative to fresh lemons or limes. Check your local middle-eastern markets from January through spring for this jewel of a find. Sabzi Polo is a great side dish for most any cut of meat, even your Easter Lamb. 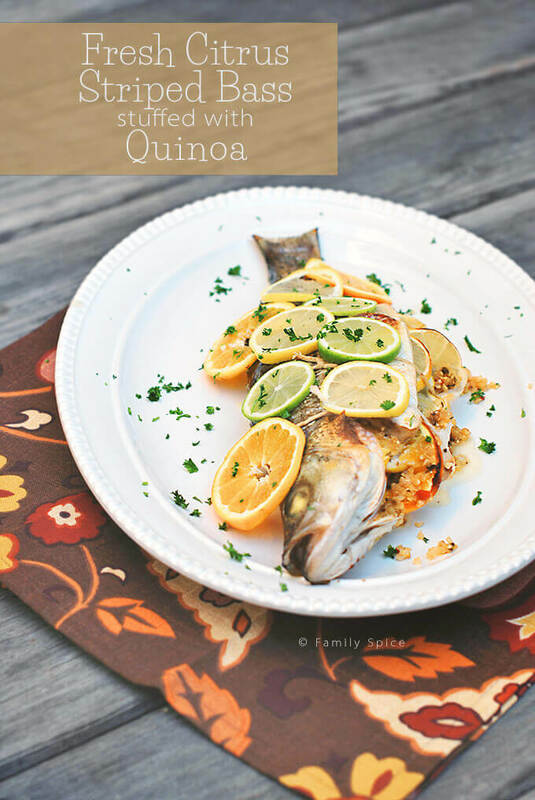 But if you are celebrating Nowruz, be sure to serve it with your favorite fish! 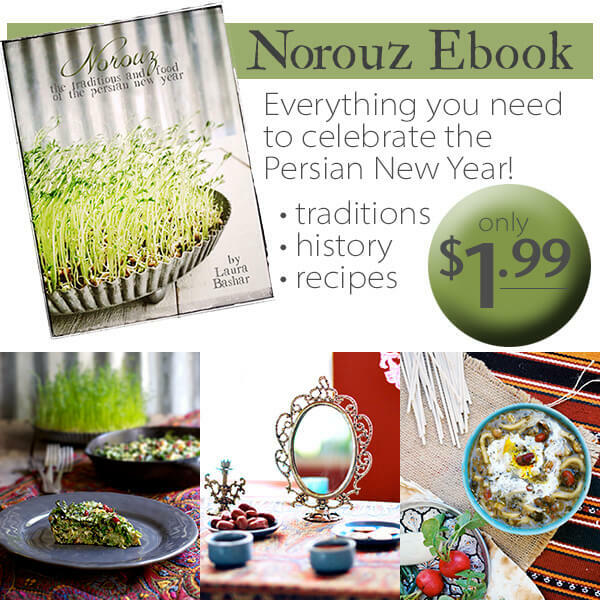 If you want to learn more about Nowruz, I have written an ebook that has everything you need to celebrate Nowruz. You can learn more about my Nowruz ebook here. In a medium-sized bowl cover rice with water. Gently wash rice by stirring it in the water with your hand. This helps wash the starch and grit out. Pour out water and repeat two more times. After washing rice a third time, let it soak in water and mix in 1/2 tsp salt. 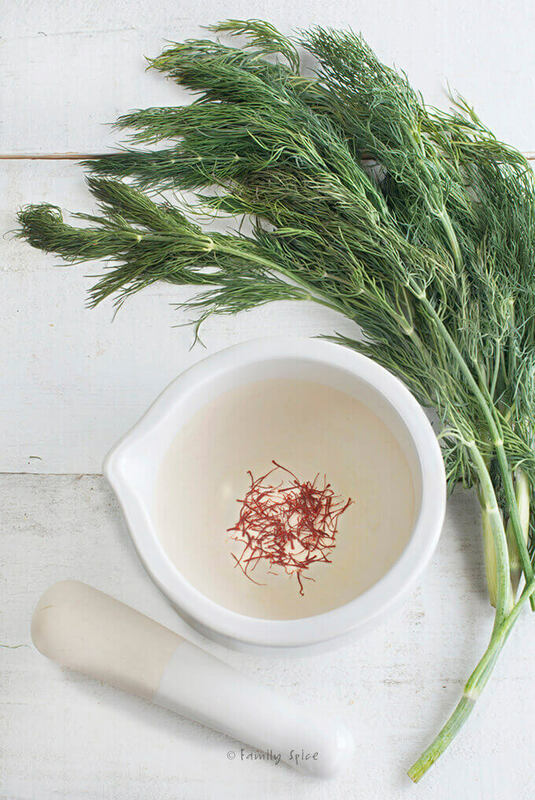 In a small bowl combine hot water and crushed saffron. 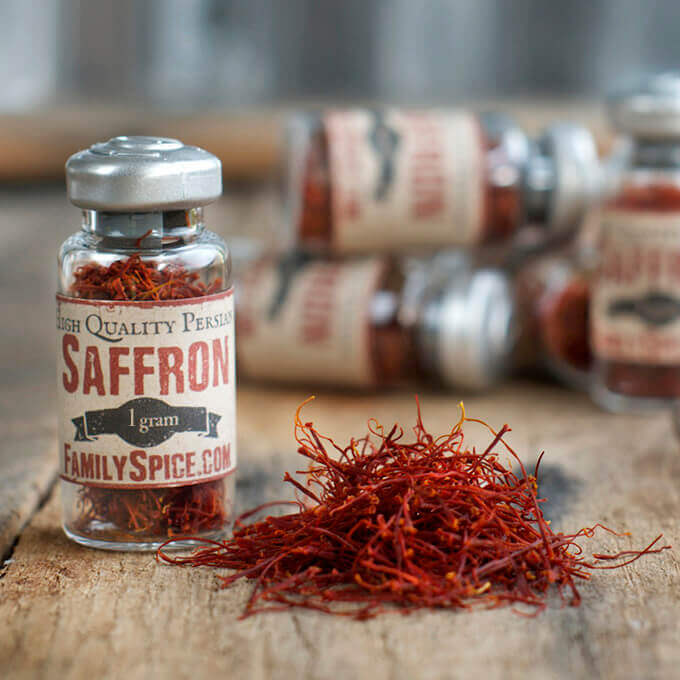 Let saffron steep for 10 minutes before using. In another bowl combine chopped herbs and reserve. Bring 8 cups water with 1/2 tsp salt to boil in a 5-quart non-stick pot. When water in pot has come to boil, drain the rice. Add the drained rice to the boiling water. 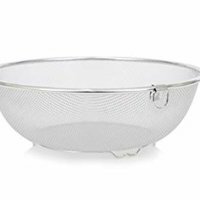 When the water returns to a boil and the rice floats to the top (approximately 6 mins), strain the contents of the pot through a fine colander. You know your rice is ready to strain if you bite a rice kernel and the center is uncooked. Return pot to burner, set heat to medium and add olive oil. Line the bottom of the pot in one layer with potato rounds. Sprinkle 1/4 tsp salt over the potato rounds. Using a spatula, gently scoop drained rice from the colander and scatter throughout the pot, over the potatoes, forming one layer. Make sure you do not push the rice in together as this will result in mushy rice. 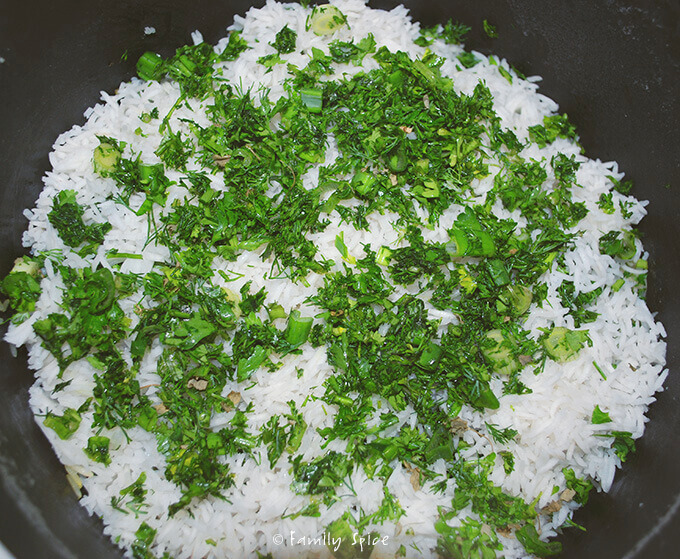 Over the scattered rice use a spatula to scatter a spatula-full of herb-mixture forming another layer. Continue alternating layers of white rice and herbs, until finished.Your pot should not be filled to the very top as you need 3 inches of empty space for the steam. Pour the saffron mixture over the top of rice. Then pour 1 TBS olive oil over the top of the rice, as well. Cover the lid of your pot with a clean towel or several paper towels, and set firmly over your pot to prevent steam from escaping. The towel will keep the condensation from dropping back into your rice and turning the rice into mush. After 10 minutes, lower heat to low and let rice finish cooking for another 45 minutes. Using a spatula, gently scoop rice out and onto serving platter. On the bottom you will find the crust (called "ta-dig"). Place the crust pieces along the platter. If the crust won't come out of the pot, stick the bottom of the pot in a sink filled with a couple inches of cold water. This will help the crust release.